21st Century skills are 12 abilities that today’s students need to succeed in their careers during the Information Age. These skills are intended to help students keep up with the lightning-pace of today’s modern markets. Each skill is unique in how it helps students, but they all have one quality in common. They’re essential in the age of the Internet. On this page, we’ll take a look at what’s included in 21st Century skills, how they help students, and why they’re so important. Video: What Are 21st Century Skills? Join Chris Zook, content marketing manager at Applied Educational Systems, as he delves into the details of 21st Century skills. Want a quick graphic reference about 21st Century skills? Keep this infographic on-hand for any student of any age — even as young as middle school! Let’s start with an overview of the skill categories. Each of these categories pertains to a specific part of the digital curriculum experience. Learning skills (the four C’s) teaches students about the mental processes required to adapt and improve upon a modern work environment. Literacy skills (IMT) focuses on how students can discern facts, publishing outlets, and the technology behind them. There’s a strong focus on determining trustworthy sources and factual information to separate it from the misinformation that floods the Internet. Life skills (FLIPS) take a look at intangible elements of a student’s everyday life. These intangibles focus on both personal and professional qualities. Altogether, these categories cover all 12 21st Century skills that contribute to a student’s future career. 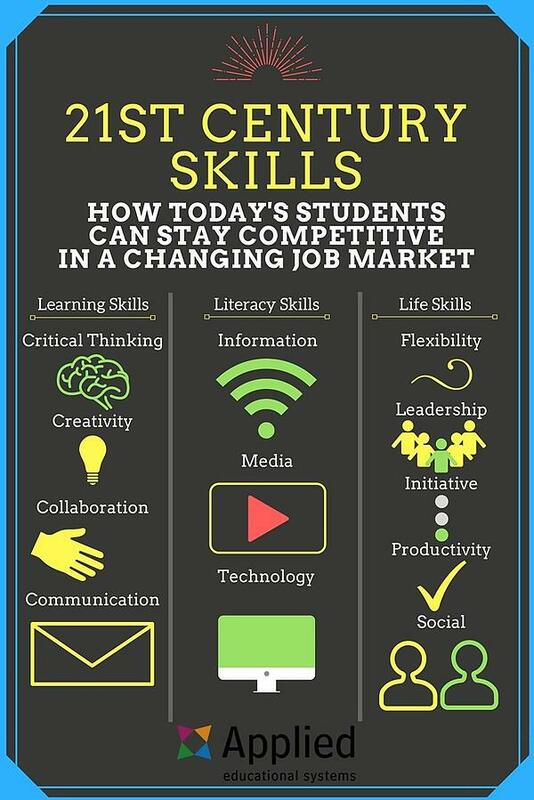 The four C’s are by far the most popular 21st Century skills. These skills are also called learning skills. More educators know about these skills because they’re universal needs for any career. They also vary in terms of importance, depending on an individual’s career aspirations. Arguably, critical thinking is the most important quality for someone to have in health sciences. In business settings, critical thinking is essential to improvement. It’s the mechanism that weeds out problems and replaces them with fruitful endeavors. It’s what helps students figure stuff out for themselves when they don’t have a teacher at their disposal. Creativity is equally important as a means of adaptation. This skill empowers students to see concepts in a different light, which leads to innovation. In any field, innovation is key to the adaptability and overall success of a company. Learning creativity as a skill requires someone to understand that “the way things have always been done” may have been best 10 years ago — but someday, that has to change. Collaboration means getting students to work together, achieve compromises, and get the best possible results from solving a problem. Collaboration may be the most difficult concept in the four C’s. But once it’s mastered, it can bring companies back from the brink of bankruptcy. The key element of collaboration is willingness. All participants have to be willing to sacrifice parts of their own ideas and adopt others to get results for the company. That means understanding the idea of a “greater good,” which in this case tends to be company-wide success. Finally, communication is the glue that brings all of these educational qualities together. Communication is a requirement for any company to maintain profitability. It’s crucial for students to learn how to effectively convey ideas among different personality types. That has the potential to eliminate confusion in a workplace, which makes your students valuable parts of their teams, departments, and companies. Effective communication is also one of the most underrated soft skills in the United States. For many, it’s viewed as a “given,” and some companies may even take good communication for granted. But when employees communicate poorly, whole projects fall apart. No one can clearly see the objectives they want to achieve. No one can take responsibility because nobody’s claimed it. Without understanding proper communication, students in the 21st Century will lack a pivotal skill to progress their careers. But the four C’s are only the beginning. 21st Century skills also require students to understand the information that’s around them. Literacy skills are the next category of 21st Century skills. They’re sometimes called IMT skills, and they’re each concerned with a different element in digital comprehension. Information literacy is the foundational skill. It helps students understand facts, especially data points, that they’ll encounter online. More importantly, it teaches them how to separate fact from fiction. In an age of chronic misinformation, finding truth online has become a job all on its own. It’s crucial that students can identify honesty on their own. Otherwise, they can fall prey to myths, misconceptions, and outright lies. Media literacy is the practice of identifying publishing methods, outlets, and sources while distinguishing between the ones that are credible and the ones that aren’t. Just like the previous skill, media literacy is helpful for finding truth in a world that’s saturated with information. This is how students find trustworthy sources of information in their lives. Without it, anything that looks credible becomes credible. But with it, they can learn which media outlets or formats to ignore. They also learn which ones to embrace, which is equally important. Last, technology literacy goes another step further to teach students about the machines involved in the Information Age. As computers, cloud programming, and mobile devices become more important to the world, the world needs more people to understand those concepts. Technology literacy gives students the basic information they need to understand what gadgets perform what tasks and why. This understanding removes the intimidating feeling that technology tends to have. After all, if you don’t understand how technology works, it might as well be magic. But technology literacy unmasks the high-powered tools that run today’s world. As a result, students can adapt to the world more effectively. They can play an important role in its evolution. They might even guide its future. But to truly round out a student’s 21st Century skills, they need to learn from a third category. Life skills is the final category. Also called FLIPS, these skills all pertain to someone’s personal life, but they also bleed into professional settings. Flexibility is the expression of someone’s ability to adapt to changing circumstances. That’s a struggle for a lot of students, especially in an age when you can know any bit of information at the drop of a hat. Flexibility requires them to show humility and accept that they’ll always have a lot to learn — even when they’re experienced. Still, flexibility is crucial to a student’s long-term success in a career. Knowing when to change, how to change, and how to react to change is a skill that’ll pay dividends for someone’s entire life. It also plays a big role in the next skill in this category. Leadership is someone’s penchant for setting goals, walking a team through the steps required, and achieving those goals collaboratively. Whether someone’s a seasoned entrepreneur or a fresh hire just starting their careers, leadership applies to career. Entry-level workers need leadership skills for several reasons. The most important is that it helps them understand the decisions that managers and business leaders make. Then, those entry-level employees can apply their leadership skills when they’re promoted to middle management (or the equivalent). This is where 21st Century skill learners can apply the previous skills they’ve learned. It’s also where they get the real-world experience they need to lead entire companies. As they lead individual departments, they can learn the ins and outs of their specific careers. That gives ambitious students the expertise they need to grow professionally and lead whole corporations. Leadership alone isn’t enough to get ahead though. True success also requires initiative, requiring students to be self-starters. Initiative only comes naturally to a handful of people. As a result, students need to learn it to fully succeed. This is one of the hardest skills to learn and practice. Initiative often means working on projects outside of regular working hours. The rewards for students with extreme initiative vary from person to person. Sometimes they’re good grades. Other times they’re new business ventures. Sometimes, it’s spending an extra 30 minutes at their jobs wrapping something up before the weekend. Regardless, initiative is an attribute that earns rewards. It’s especially indicative of someone’s character in terms of work ethic and professional progress. That goes double when initiative is practiced with qualities like flexibility and leadership. Along with initiative, 21st Century skills require students to learn about productivity. That’s a student’s ability to complete work in an appropriate amount of time. The common goal of any professional — from entry-level employee to CEO — is to get more done in less time. By understanding productivity strategies at every level, students discover the ways in which they work best while gaining an appreciation for how others work as well. That equips them with the practical means to carry out the ideas they determine through flexibility, leadership, and initiative. Still, there’s one last skill that ties all other 21st Century skills together. Social skills are crucial to the ongoing success of a professional. Business is frequently done through the connections one person makes with others around them. This concept of networking is more active in some industries than others, but proper social skills are excellent tools for forging long-lasting relationships. While these may have been implied in past generations, the rise of social media and instant communications have changed the nature of human interaction. As a result, today’s students possess a wide range of social skills. Some are more socially adept than others. Some are far behind their peers. And some lucky few may be far ahead, as socializing comes naturally to them. But most students need a crash course in social skills at least. Etiquette, manners, politeness, and small talk still play major roles in today’s world. That means some students need to learn them in an educational setting instead of a social setting. For them, it’s another skill to add to their lives. Now that we’ve established what 21st Century skills are, let’s answer the next big question. Do employers actually want people with 21st Century skills? What’s the Demand for 21st Century Skills? While 21st Century skills have always been important, they’ve become essential in a worldwide market that moves faster by the day. These skills all double back to one key focus. Someone’s ability to enact and / or adapt to change. This is because any industry is capable of changing at a moment’s notice. Industries are now regularly disrupted with new ideas and methodologies. Those industries that haven’t been disrupted aren’t immune though. They just haven’t been disrupted yet. With that in mind, the world has entered an era where nothing is guaranteed. As a result, students need to learn to guide the change that’ll inundate their lives. At the very least, they need to learn how to react to it. Otherwise, they’ll be left behind. This is especially true as customer demand accelerates in all industries along with expectations for newer features, higher-level capabilities, and lower prices. In today’s marketplace, falling behind means becoming obsolete. That’s a familiar concept to all of today’s students as tomorrow’s advancements make today’s miracles quaint or unimpressive. Today, the only consistency from year to year is change. With 21st Century skills, your students will have the adaptive qualities they need to keep up with a business environment that’s constantly evolving. How Does AES Help Students with 21st Century Skills? AES uses a tried-and-true approach to help you teach students about 21st Century skills. We’ve hand-crafted specialized curriculum modules that fit into any teacher’s career prep course. These five modules only scratch the surface. In each one of them, your students can learn valuable 21st Century skills that they’ll use in their careers for the rest of their lives. With you at the helm, AES digital curriculum supplements your expertise by giving students the ability to work at their own paces. Plus, it saves you time since you can integrate pre-made modules into your own lesson plans. This also gives you a blended classroom, which is proven to save time, promote tech literacy, and cut costs all at once. It even gives your students the chance to go back and review on their own time. That means you can concentrate on helping the students in your class who are furthest behind while others move forward on their own. That’s a lot of value from a single learning management system. Still, it’s important to note that AES curriculum isn’t intended to replace your teaching expertise — it works best as a supplement. After all, you’re the one with the experience, and that’s something your students can’t learn from software alone. But with AES digital curriculum, you get to save time, money, and stress all at once. Teaching is a tough job — AES curriculum makes it a whole lot easier, even if you're a new teacher using it for the first time. This goes double for 21st Century skills. When you need to teach your students the essentials they’ll need in the workplace, AES has your back. Do you want your students to thrive in their careers? AES digital curriculum is your one-stop solution. With a variety of curriculum options, you can customize your approach to every 21st Century skill to make sure your students learn, remember, and implement them as quickly as possible. Check out a free 5-minute demo video of AES curriculum today!